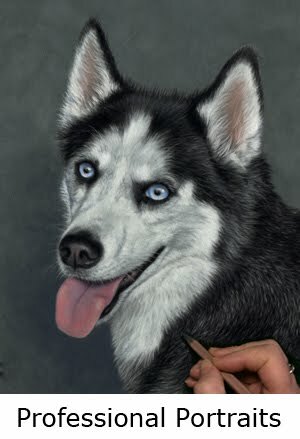 A LOT of detailing work goes into each of my portraits. 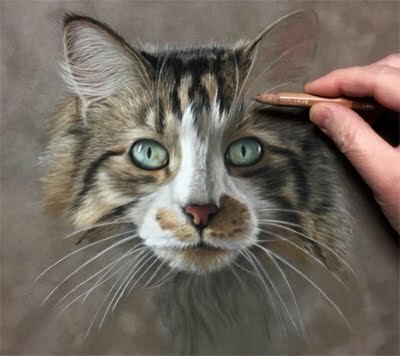 I always tell my clients that the better the reference image, the easier it is for me to reproduce a realistic looking portrait of their pet. 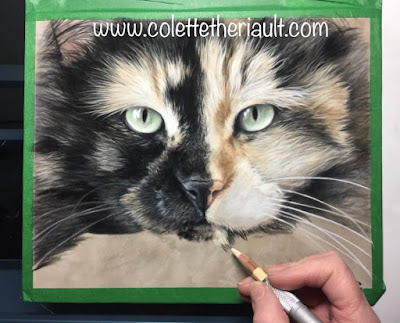 However, finding good photos is not always possible and so in those instances I can work with several not-so-good photos and along with client feedback, I have always been able to achieve a pleasing and realistic portrait of their pet. Keep in mind however that clear, close up shots taken in natural light make the best reference images. For more information on how to choose or take your pet's photo for a portrait, you can read the following useful article I wrote: Tips for Taking Quality Photographs . Stay tuned to watch the final progression of this cat pastel portrait in my future post. Thanks so very much for following! It is good to see new posts from you. Superb work like always. Hello John! Been a while; thanks so very much for your kind words! Quelle belle progression ! mes félicitations.